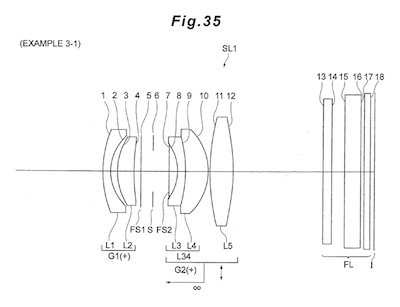 The interesting part is that the Japanese patent is for a 23.65mm DX lens (28.4mm in diagonal). It's basically a 1.65x scaled up version of the lens patent filed in the US. Which are now the correct numbers? Is Nikon really obscuring the real calculations? I don't know, but a DX size EVIL camera sounds much better and may explain why Nikon is taking their time on that project. Based again on previous patent applications, the Nikon EVIL camera is not expected to have a F-mount, but I am sure there will be adapters that will allow the use of F-mount lenses. Follow this [NR] forum discussion for more info on this topic. Read more on sensor sizes here and here.